With the increase in bicycle traffic on campus, it is important for both cyclists and motorists to be careful driving on our campus. Cyclists must remember to follow the same rules as motorists while on the road and use proper hand signals when applicable. Ensure your bicycle is equipped with a bell, headlight and rear reflector for proper visibility. 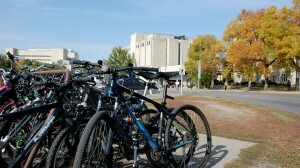 Bicycles are allowed on campus pathways, but a reminder that crosswalks are for pedestrians only: Cyclists are expected to dismount and walk with their bicycle when crossing the street. Both motorists and cyclists must be aware of their surroundings and drive and ride as safely as possible to prevent injury. Collisions between bicycles and vehicles can be deadly for cyclists; please always wear a helmet when you ride. There are now two traffic circles on our campus, as well as several more which have appeared throughout Saskatoon. Traffic circles, or roundabouts, are not only more efficient than intersections at moving vehicles, but they are also safer (they calm traffic) and better for the environment (they reduce vehicle idling time). Some drivers new to Saskatoon and our campus may not be familiar with how traffic circles operate. Campus Safety has provided the following tips to help motorists, pedestrians and cyclists safely traverse our campus roundabouts. • Reduce your speed as you approach the roundabout. • Yield to traffic already inside the circle coming from your left. • Engage your right turn signal and enter the roundabout to your right when it is safe to do so. • Continue around the circle until you reach your exit. • Weather permitting, do not slow down or stop to make your exit. • Exit to your right. • If you miss your exit, continue around the circle until it comes up again. • Cross at marked crosswalks only. • If unmarked, cross the roadways as they approach the circle. • Pedestrians should never enter the circle and should follow the sidewalk. • Never cross through the centre island. • If you are riding with traffic, you must follow the rules for motorists. • If you have dismounted, you must follow the rules for pedestrians.